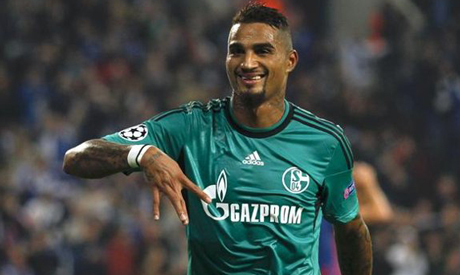 Schalke's Ghanaian midfielder Kevin-Prince Boateng said on Monday he suffers a bit on seeing his former club struggling in all competitions. The Italian giants struggled in the serie A as they lie 12th on the league table and were eliminated from the Champions League round of 16 following to their loss to Atletico Madrid last week. "I suffer a bit to see AC Milan in this situation, because I am still a fan and it’s always in my heart," Boateng said on Monday. The former player for Milan, who won the serie A title in 2011 during his three-years spell there, backed the team's coach Calerence Seedorf, explaining that he needs more time. The Dutch coach was appointed last January in succession to Massimiliano Allegri, who was sacked for poor results. "[Clarence] Seedorf is certainly better as a player, because he played for so many years. As a coach, he needs a bit of time as it’s not easy to get into a situation like that at Milan and change things in a day. "For me, he can be a great coach, but you have to give him time," he said of the newly appointed boss."